Join Artists & Fleas and We Are Women Owned for a community discussion detailing everything you’d ever need to know about retail pop-ups. Whether you are a seasoned merchant or you’ve never sold your product before, this event will answer all of your questions. Join us for networking and wine immediately following, including a chance to chat with curators of both Artists & Fleas and We Are Women Owned markets! Moderated by Lisa Nicole Rosado, Founder owner & CEO of We Are Women Owned. Lisa is on a mission to create an environment where women-owned businesses come together as sisters—not competitors—via cultivating community, hosting pop-up shopping events, masterminds and 1:1 mentorship. Michelle Friend is the Director of Markets for Artists & Fleas. With a strong background in trend forecasting and retail, Michelle is always looking for the next great pop-up for Artists & Fleas. 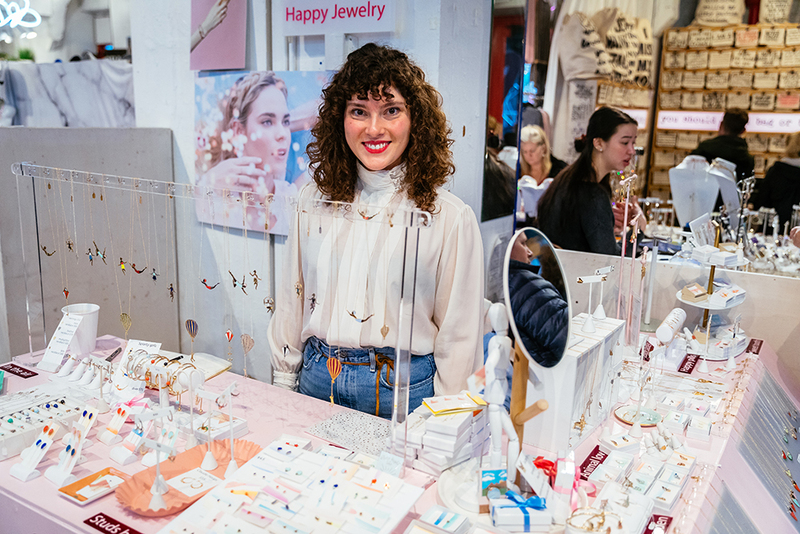 Carrie Morrissey is the CEO and Creative Director of ISLYNYC, a laser cut acrylic jewelry and accessories brand designed and produced in Greenpoint, Brooklyn. ISLYNYC has made its mark with recognizable and iconic statement pieces such as the Splashes Glasses, “Sorry Not Sorry” Necklace and Acrylic Visors. In addition to Artists & Fleas, ISLYNYC can be found on their website and in select boutiques. Caitlin Nystrom is the Owner & Stylist of styleNmotion. With an emphasis on mixing, matching & layering pieces, styleNmotion is an online women’s apparel boutique catered to helping women build a stress-free wardrobe that they’ll feel confident about. Sam Sisca is the Founder & CEO of Social Sunday. Social Sunday is a woman-owned graphic clothing line made in the USA and hand-printed in Brooklyn, NY that makes clothes for the go-getter that lives for the balance between an active lifestyle and relaxing self-care Sundays.